Weiss Cannon Fire Stroke is one of the most recent tennis strings from the German company, Weiss Cannon. This spin friendly tennis string appears to be the little cousin of one of, my personal favorites, Weiss Cannon Ultra Cable (click to read my review); just a tad different in playability and performance. I have reviewed this tennis string a few different times at different tensions. Below are my findings. Starting my warm-up, where I go with 15 or so minutes playing short court at 50%, I honestly thought Fire Stroke was going to be a bit on the stiff side. The 4 sided polyester tennis string definitely gripped the ball nicely but I thought that I should have gone lower in my tension selection (48 pounds – 2 piece), but that soon changed. After the warm-up, my partner and I engaged in a bit of a baseline rally, just to get things dialed in. This is where my opinion of a stiff stringbed changed; Weiss Cannon Fire Stroke really transformed at full speed strokes. While the string was still a bit on the stiff side, the strings’ construction (hyper-poly) offered a very very plush playing experience. The ball would launch off the string bed at incredible speeds and with some above average spin! Balls were dipping in at or near the baseline and maintaining velocity after impacting the tennis court. I was pleasantly surprised that the tennis strings offered a nice response to impact. I never really experienced any sort of arm tenderness with this string. I could have gone a little higher in tension to control the depth of my shots. While Weiss Cannon Fire Stroke didn’t offer as much spin as the sharper Ultra Cable, I still was impressed by spin production. As mentioned above, balls were dipping deep and in the corners. Though the spin was nice on pure shots, any time I mistimed my forehand or backhand and hit flatter, the ball would line-drive out…by a lot. If you’re going to be relying on your spin, make sure that you commit to the topspin, otherwise you’ll lose a lot of points. In addition to spin characteristics, the balls wouldn’t kick up quite as much as other spin friendly poly tennis strings. Though, the ball penetrates more – penetrate through more than kick up – which was throwing my partner off his timing. This is always favorable, especially with people you’ve played with frequently and are used to the type of balls you’re hitting at them. Fire Stroke isn’t a high powered poly tennis string. Its lower powered design is optimal for players looking to move the ball around inside the court. Even with a lower tension, around 48 lbs, I was able to get plenty of depth but didn’t really have an issue controlling the ball. I generally was able to find the inside of the lines on most shots. 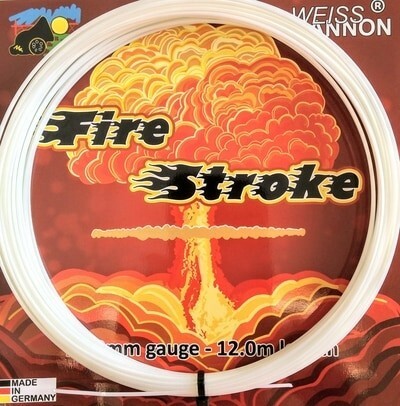 Weiss Cannon Fire Stroke definitely has a longer “strung life” than many polyester tennis strings on the market, though it’s not as long as Weiss Cannons’ Ultra Cable. Fire Stroke definitely reached a loss of tension point, but it was a few hours after it’s competitors have already dropped off. If I were to actually tie a time-frame to it, I would say tension is playable for about 8 – 9 hours of play (mixed ground strokes and serving). Comparing Fire Strokes’ durability to other top brands, the 8 – 9 hours of play is a few hours longer than most and falls a little short to other brands. Interestingly enough, I ended up having to cut out the string long before they broke. Even in the 3 tension settings (44lbs, 46lbs, and 48lbs), neither of them ever snapped. I was also impressed with the lack of notching that Fire Stroke had; with the heavy topspin and hundreds and hundreds of tennis balls hit, the tennis strings didn’t really cut into each other as much as a traditional round poly or even sharp shaped strings do. Remember, notching strings are bad, this kills the strings. There’s always a small challenge installing polyester tennis strings; however, Fire Stroke still being a medium-stiff tennis string, stringing it proved to be a breeze! It was relatively easy on the fingers, yet firm enough to get though blocked holes without having to use an awl. Weaving crosses were smooth, even when performing a “hard weave.” My knots tied tightly and I never felt that the tie-offs were ever in jeopardy of snapping. So, a tennis stringers delight! As much as I liked Weiss Cannon Fire Stroke, I don’t know that this would be my “Go To” tennis string. It’s a great string that has a lot of good qualities, spin, tension stability, comfort, and tennis string life. I just kind of felt that it was a slightly above average tennis string. I believe Fire Stroke is a solid option for tennis players looks to transition from a full bed of synthetic gut or multi-filament tennis strings. Even junior players would benefit from Fire Stroke, who are looking to move to a lowered powered poly that will introduce spin and a firm response from their tennis strings. Fire Stroke is definitely a spin friendly tennis string to try that is low powered, firm, and a bit more on the comfortable side for a polyester tennis string. Unfortunately Tennis-Warehouse doesn’t carry Weiss Cannon Fire Stroke at the moment, but be sure to check back on their Weiss Cannon page frequently!